It’s a book about vanilla. Just vanilla. Well, you’d think that, wouldn’t you? Of course, there’s a vanilla ice cream in there, which should come as absolutely no surprise to anybody, but there’s plenty more besides, nearly 240 pages or thereabouts, in fact. Again you’d think so, but not entirely. Yes, there are a fair number of dessert dishes – vanilla is a natural dessert ingredient, a friend of the sweeter end of the culinary spectrum, but it also has uses in savoury dishes, and for every vanilla layer cake recipe, there’s a recipe for baked beans, made with cider and – I’m not quite sure about this – vanilla. I’m just not going to try that particular recipe. 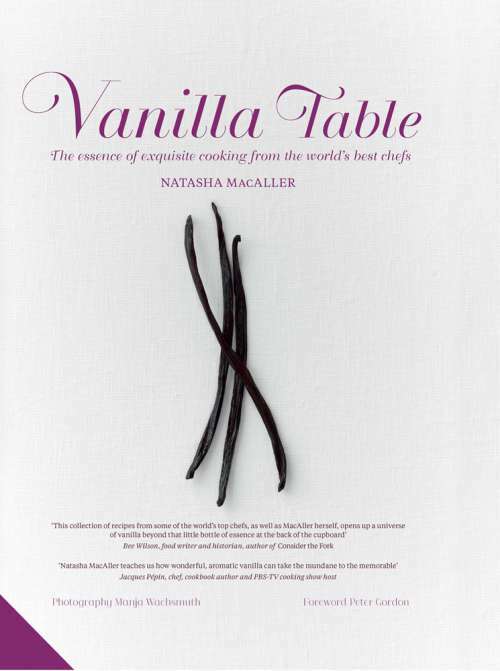 As Natasha Macaller, the author of Vanilla Table: The Essence of Exquisite Cooking from the World’s Best Chefs, and so-called ‘Dancing Chef’, because she used to be a professional ballerina, notes in her introduction, vanilla is “the power behind the throne of fragrance and flavour, an integral component of most chocolate creations and the world’s favourite ice cream. Its captivating scent is everywhere, hidden in more things than you can imagine”. Big claims, and likely true. Vanilla Table is a collection of recipes curated by MacAller, but many of which originate from thirty-two esteemed contributors, including superstars such as Yotam Ottolenghi, Peter Gordon, David Lebovitz and none other than Anton Mosimann. For that range alone, this collection is worth a look, and that’s before you consider the quality of the book itself – superb photos, excellent presentation and writing, a passionate voice pulling these thirty-two different cooks together around a single, often overlooked ingredient, that turns out to be a good for a little more than just flavouring an ice cream.